Smith & Wesson Tactical Collapsible Batons made with tempered steel. Limited Lifetime Guaranteed by Smith & Wesson (Taylor Brands LLC). The Smith batons are heavy duty tools of compliance for the professional security guard or self defense weapons for consumers. They are of excellent fit and function and swing with a solid impact and quick results. 5 sizes available from the ultra-concealable 12 inch model to the 26 inch. Open with a flick of the wrist and at the ready when needed. Great self defense weapon for security guards or law enforcement and affordable for skilled consumers.. The 16 inch to 26 inch models come with very practical ballistic nylon holster that has stiff walls to allow one handed pull and is adjustable to the width of belt you will be wearing it on. The holster alone has great tactical value with this one characteristic. The Smith & Wesson S.W.A.T. lightweight baton is as effective as it is light. Lightweight construction makes deployment faster without sacrificing strength. 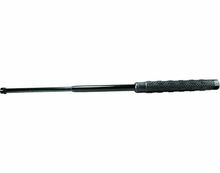 High strength steel and aluminum construction ensures this baton is sturdy in the most demanding situations. We have the 26 inch model in stock. The 24 inch dimensions: Full length Overall: 24.0"(60.9 cm) Handle: 9.2" (23.3cm) Weight: 1.0 lb. 0.2 oz. The 26 inch dimensions: Expanded Overall: 26.0" (66.0 cm) Handle: 9.7" (24.6 cm) Weight: 1 lb. 1.8 oz. The S&W batons are well made and comparable to the ASP Sentry Batons and are a good choice to buy. SWBAT16H Overall: 16� Handle: 6.6� Weight: 13.2 oz.